Embroiled in a cultural controversy, Hobby Lobby presented a unique challenge for our talent pool. A successful company with divisive values needed a fresh look and better online shopping experience. I believe projects shouldn’t define people and volunteered to lead the creative with a very small team of circulating creative contractors and a dedicated development team. Working in the Agile process we phased the creative handoffs and worked in parallel with functional analysts one delivery ahead of the development team. The accelerated approach was made possible by being very nimble and well documented with the UX and design elements as well as clear and frequent communication with the client team, who was also ramping up to manage the new shopping tool we were proposing. 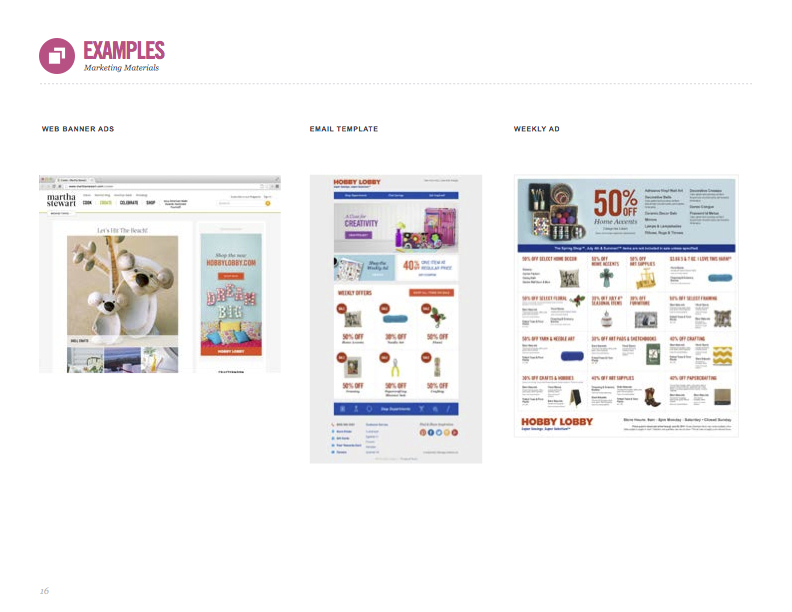 The solution surfaced the Hobby Lobby story and store in a responsive modular layout and a brand new platform. The website needed to support several project page states, tutorials, and a robust online product offering with alternating sales, dozens of product SKU variables and fluctuating inventory. Starting from scratch, we presented in a collaborative client work session various large format moodboards with creative examples from competitors, print materials, and subject matter experts to establish a design language and starting point to anchor the creative concepts.